Kitchens and dining areas are an essential part of any business, so they need to look great. 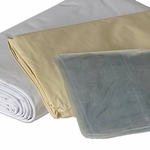 Wholesale kitchen linens have made it easy to provide linens and supplies in bulk to companies who are ready to take their business to a new level. They offer affordable choices for baths, bedrooms, and kitchens always with free shipping. Wholesale kitchen supplies include a wide selection of kitchen tools and linens in a variety of colors and styles. Buying wholesale makes it convenient to purchase a broad range of commercial kitchen items in different fabrics and colors that match any décor. Both the Allegro and Permalux brands are part of the bulk collection. The Allegro Faux Leather Placemats are made of a durable pressed vinyl and are available in camel, chocolate, and black. They have a very classic look at 12 x 17 inches and can be wiped off quickly with a damp cloth. The Permalux Placemats also measure 12 x 17 inches and are made from a durable wrinkle resistant cotton/polyester blend with a movie weave. They are available in French vanilla, hunter, black, sandalwood, white, and burgundy. The right napkin is the perfect finishing touch for any table setting. Permalux made their Cotton Blend Movie Napkins in an extra-large 20 x 20-inch size and are wrinkle resistant. The color choices include white, burgundy, sandalwood, black, French vanilla, sea foam, and hunter. The Permalux table cloths come in round, square, and rectangular in a variety of sizes. The lighter colors are white, French vanilla, ivory, and sandalwood. Darker colors come in black, red, gold, and hunter. The Permalux fabrics are colorfast and stay looking new wash after wash. These products are made to go together, and the colors can be mixed and matched for the perfect effect. A wholesale supply company that specializes in selling quality products by the case to businesses and institutions across the United States is a great way to get wholesale kitchen supplies. The tables are one of the first things that people see when entering a room and using the right linens is the key to success. Shower liners are an essential component to your bathroom because they add privacy to your shower or tub and they help to keep water from splattering all around the room. Water will splash about while you are in the shower which can make a mess out of everything. Choosing the right material for your liner or curtain will help to keep your bathroom fresh. These are a beautiful addition to your decor. They are made from a variety of different materials and tend to be more expensive. Here are some fabric options with pros and cons. This is a great option for their low price and water resistant properties. Below is a list of the choices available and their pros and cons. Choosing the right option for your bathroom is dependent upon personal preference. With so many to choose from it can seem overwhelming. I hope that these lists have helped you in your quest for a shower liner. Those in the hospitality business realize that wholesale pillows make the difference between profit and loss. The guests benefit from a good night's rest and the hospitality provider benefits from satisfied guests who return again and again. The guests also spread the good word of mouth advertising, which is irreplaceable. Let's see how wholesale pillows contribute to proper hospitality techniques. Pillows in bulk quantity offer a cost efficient way to freshen rooms in hotel, motel, and bed and breakfast applications. The globally responsible linens manager of such an establishment procures environmentally friendly pillows that are made from 100 percent recycled material. These polyester-fill pillows only get better with washing, but that is not all. Their recycled content saves landfills from overflowing with discarded plastic materials. Unlike down filled pillows, fiberfill pillows do not clump and can fluff with little effort by housekeeping staff. The hospitality manager may take his efforts further by providing pillow protectors to ensure that his choice of pillow lasts the longest possible time before needing replacement. When the time to replace does arrive, fiberfill pillows satisfy all the needs of both guests and host. To get down to particulars, a down alternative pillow treated with antimicrobial agents offers permanent protection against microbes and germs. The shape and loft of such a pillow have proved to remain consistent after fifty launderings. The pillow's outer shell consists of 100 percent cotton fabric and 233 thread count, making this a pillow that combines luxury with eco-friendliness. Guests and hosts alike appreciate the difference that a good pillow makes in attaining a proper restorative sleep. Taking into account the environment by ordering wholesale pillows is only one more step to successfully managing the practical side of hospitality. Make time for the right decision concerning pillows and guarantee returning, satisfied guests.